The Snow White express has started. 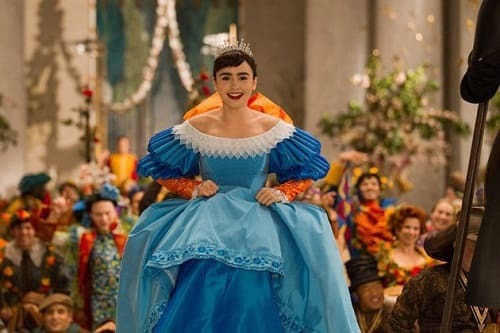 In a move reminiscent of when Armageddon and Deep Impact both arrived in theaters within months of each other, Mirror Mirror and Snow White and the Huntsman land in movie houses in much the same manner. Yet, to compare the two is hardly fair. The only thing congruent in both is the lead character whose skin is white as snow. Mirror Mirror is a family film and as such it truly will hit a nerve with those audiences in the best of ways. After a series of R-rated films such as The Cell and The Immortals, director Tarsem Singh was ready to tackle a family flick. He has found a perfect muse in Snow White (Lily Collins), the Seven Dwarfs and that deliciously devilish Evil Queen (Julia Roberts). The auteur’s vivacious visual style he’s shown on previous works is effervescent on Mirror Mirror. In this live action version of the classic Snow White story, our heroine has been locked in her castle since her father disappeared in battle -- prior to that he had married a shrew, well, at least according to Snow. With the King out of the picture, the Evil Queen has been left to rule at will which usually involves suffering common folk and a legion of royal workers who are terrified at her every whim. Knowing that Snow White is the rightful heir to the throne is why Roberts keeps Collins well out of sight. Things change drastically when a prince arrives who has millions and is in need of help from a pillaging band of dwarfs. He can save the kingdom from the queen’s reckless spending, simply by marrying her. Only thing… he has eyes for Snow when she appears during a royal party in his honor. When it comes to the story itself, we leave you with this: You think you know the Snow White fairy tale? In the hands of Singh, audiences will realize that this historic story has permeated their subconscious. The helmer has things happen on screen armed with the knowledge that he has an audience’s history with the story already in his pocket. He can start an adventure in the third act, literally after the opening credits. After Singh’s turn bringing Snow White to life, Movie Fanatic cannot wait to see what the movie magician comes up with next.